Things that run through my mind while I am trying to do annoying paperwork.... I need to repot all my plants. And why is paper made out of trees and not banana peels or avocado skins? And are people really that crazy about avocados that it is now a trend to propose with a ring in a avocado? Apparely it is a thing now and I don't feel very good about it. And why haven't I made brownies in a long time? This is a good recipe to have on hand because it is simple, doesn't require to have any fancy stuff to make them so I always have the ingredients, and they make the house smell like chocolate. As far as brownies go, these are more fudgy then cakey. Just so you know. The stuff. Cocoa powder, flour, baking powder and salt. Also some coconut oil, vanilla, sugar, ground chia seeds, coffee, and chocolate chips. All to become brownies. 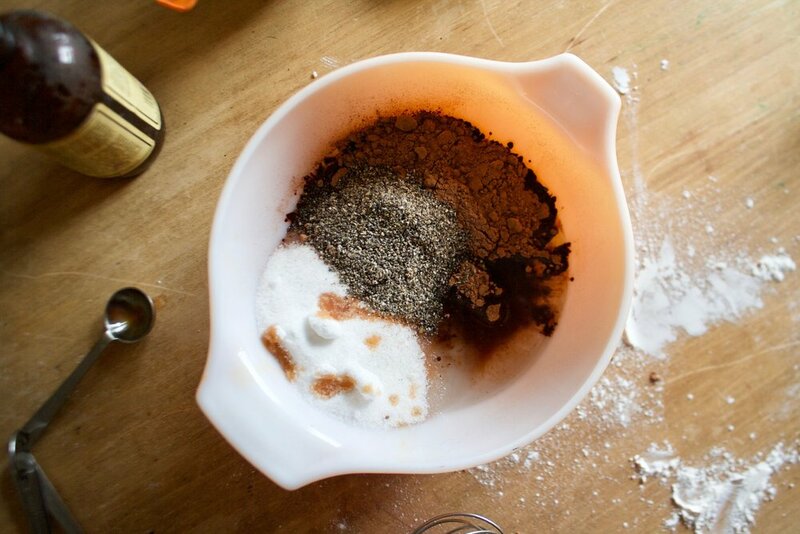 The coca powder, sugar, vanilla, chia seeds, and hot coffee get whisked together with the melted coconut oil (which I melted in the microwave in the bowl first). Whisk it until smooth and lump free. I usually mix dry together before I add it to the wet but I really didn't want to get another bowl so I sprinkle on the baking powder, then the salt, then top wth the flour. Use a rubber spatula to fold the dry into the wet unit just incorporated to avoid over mixing he batter. Can't forget the chocolate chips. Fold those chocolate chips into the batter as well. Pour batter into a well greased and lined pan and pop it into the oven to bake. 20ish minutes later you are looking at a pan of brownies. And when I pulled them out I realized that there was something missing. Melted the chocolate with coconut oil and smothered it all over the suckers and sprinkles on the sprinkles . Cut up and ready to go. makes and 8x8 pan which could feed anywhere between 1person to 9 people. Optional chocolate glaze is 1/4 cup chocolate chips and 1 teaspoon coconut oil. And sprinkles to finish. Combine the melted coconut oil (I microwaved the coconut oil in the bowl) sugar, cocoa powder, ground chia, vanilla, and hot coffee in a medium bowl. Whisk together until completely combined and smooth. Let sit for a few minutes then add in the flour, baking powder, and salt together and fold in in with a spatula. Once combined, add in chocolate chip and fold those in as well. Be careful not not overmix or you will end up with gummy brownies. To make the chocolate glaze, combine chocolate with coconut oil and microwave for 30 seconds then mix until a smooth consistency. Pour onto cooled brownies, disperse, then cover with sprinkles . Cut into squares and eat..